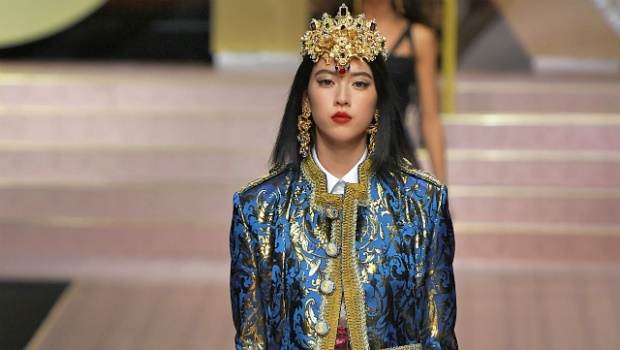 Italian luxury fashion label Dolce & Gabbana in hot water once again for cultural and racial insensitivity. 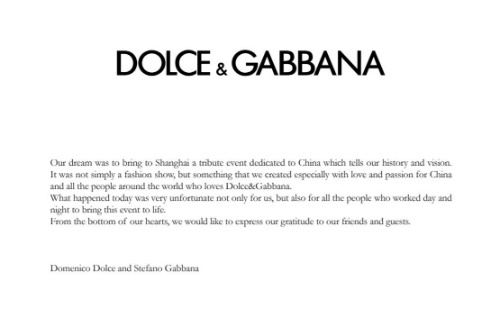 Dolce & Gabbana's "The Great Show", which was due to take place on Wednesday 21 November in Shanghai, China has now been postponed since the Cultural Affairs Bureau of Shanghai cancelled it on its originally scheduled date, as a result of three 40-second Instagram videos that sparked controversy. The Italian luxury brand's controversial videos in question show an Asian model attempting to eat Italian cuisine with chopsticks, while "typically" Chinese music plays in the background, essentially perpetuating cultural and racial stereotypes under the guise of celebrating and appealing to the highly sought after Asian consumers. READ MORE: Kimonos: Appreciation or appropriation? The tone deaf videos which were posted on D&G's Instagram account, also appeared on their Twitter, Facebook, and Weibo accounts in China, but have since been deleted from their social media accounts in China. Instagram's fashion knockoff whistle-blower Diet Prada has been quick to call the luxury design duo out on their offense. In a repost of one of the "chopstick eating series" videos, part of their captioned critique reads, "Pandering at it's finest, but taken up a notch by painting their target demographic as a tired and false stereotype of a people lacking refinement/culture to understand how to eat foreign foods and an over-the-top embellishment of cliché ambient music, comical pronunciations of foreign names/words, and Chinese subtitles (English added by us), which begs the question—who is this video actually for?" However, Gabbana's post on his personal Instagram states otherwise, claiming the account was hacked. "Our dream was to bring to Shanghai a tribute event dedicated to China which tells our history and vision. It was not simply a fashion show, but something that we created especially with love and passion for China and all the people around the world who loves Dolce & Gabbana." But celebrity guests and a few models are not buying it, as a few of them had already declined to attend by the time the postponement was announced, CNN reports. Skeptical about the apology, Chinese-French model Estelle Wong, withdrew from the show, responding to the statement as follows: "You don't love China, you love money. China is rich yes but China is rich in its values, its culture and its people and they won't spend a penny on a brand that does not respect that." This is not the first time Dolce & Gabbana has come under fire for being problematic. In 2016, the designers faced backlash over their "slave sandal", and in 2017 a pair of Fall '17 sneakers was not received well due to its fat-shaming connotations. Both times, a flippant response was given and then an apology statement later issued. This begs the question, is Dolce & Gabbana employing this new marketing tool where brands deliberately offend in order to spark outrage, thereby drawing lucrative attention to themselves? Perhaps. Or maybe they're living up to fashion's lesser desirable trait; ignorance.